We're trying to build up our repertoire of broccoli dishes since it is one vegetable that seems to be always available. It has become our go-to vegetable when I feel that our family is getting vegetable-deprived. Usually, we stick to the same old stir-fry with garlic. 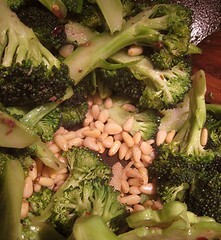 TS decided to do a quick stir-fry -- oops, I mean, sauté -- of the 3 or so heads of broccoli we have sitting in the fridge, but done Sicilian-style with anchovies, garlic, red pepper flakes, and pine nuts. It barely needs a recipe, so the one below is simply a guide. Enjoy! 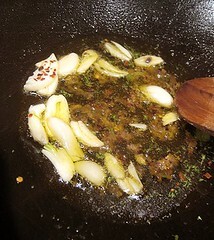 Into a cold sauté pan, add olive oil, garlic cloves (simply smashed, or sliced), red pepper flakes, and anchovies. Turn the heat to medium and wait until the garlic starts to sizzle. Turn the heat to high and add your broccoli florets. Cook until broccoli has softened but still retains a slight "crunch" (you may need to lower the heat if you wish to cook the broccoli for a longer time to a softer texture). 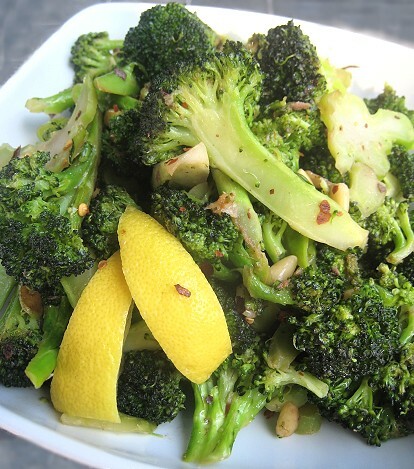 When the broccoli is the desired doneness, add the toasted pine nuts, squeeze the lemon juice over the broccoli, and adjust seasoning. I hope you're planning to eat the leftovers tossed with pasta! You'll all have smiley faces. I bet that was really tasty! We do love our garlic!